New Delhi, April 11: Debt-ridden Jet Airways on Thursday cancelled all its international flights for the next two days due to the scarcity of funds, say reports. Flights bounds to Amsterdam, Paris and London have been cancelled for the upcoming next few days. An additional 10 aircraft have been grounded due to non-payment of amounts outstanding to lessors under their respective lease agreements. As per to the IANS sources, the government is monitoring the operational situation at Jet Airways closely to ensure the airline complies with overseas flying rules. It is to be known that due to the cash crunch, the premium airliner is operating only about 14 aircraft down from 26 last week. Jet Airways Crisis Continue as Indian Oil Corporation Denies Fuel to Aircraft Over to Non Payment of Dues. With barely a few flights being operated by Jet Airways, the situation might arise that can lead to the suspension of its international operations. According to international rules, an airline needs to have a minimum of 20 aircraft to be eligible to operate international flights. Until last week, the airline operated 26 aircraft, including Airbus A330s, Boeing 777s, 737-800 and ATRs, to various destinations like London, Toronto, Singapore, Amsterdam, Paris, Bangkok and domestic sectors like Mumbai-Delhi, among others. 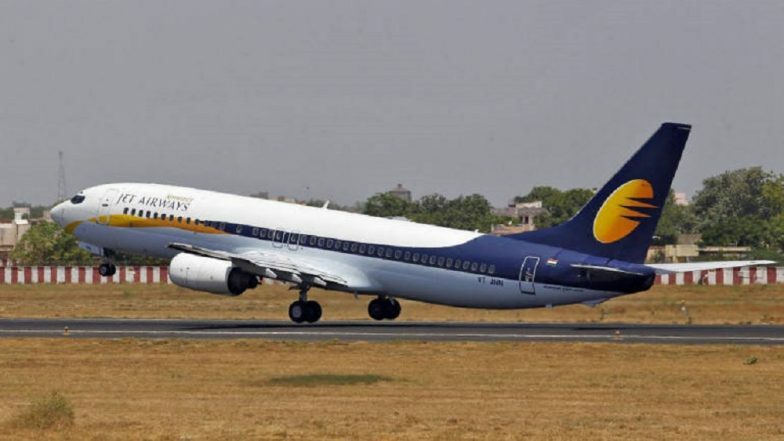 However, with the current situation prevailing, aviation regulator DGCA on Wednesday announced it de-registered seven Boeing 737-800 aircraft of Jet Airways on Wednesday. By doing so, DGCA has allowed Jet's lessors to take the planes out of the country so that it can be leased to any other airline.